Forget Netflix and chill; movie night just got a whole lot better with our list of the best home cinema projectors to watch your favourite blockbusters. If movie night is a big deal in your home, then maybe it’s time to step up the game with a home cinema projector which will really set the mood for any movie buff. A home cinema projector is specifically designed to display full HD resolution just like your TV would, and they are able to be connected to your speakers for the best quality sound to complement its picture. You can place a home cinema projector in any room where there is free space on the wall, so whether you want it in your lounge, bedroom or dedicated cinema room, there is a different sized projector to suit all homes. Don’t think that having a smaller home means you can’t create your own cinema room. For smaller rooms, a short throw projector is ideal as it can be positioned quite close to a wall or screen without affecting the size of the picture. Or if you’re looking to turn a much larger space into your home cinema, opt for a long throw projector which generally need to be placed further away from the wall, and can project a large image from up to around 15 metres away. Make sure you check the resolution to ensure you choose a projector which is right for the space you will be using it. Anything above 1280x720 will be of high definition quality so it is recommended not to fall below this resolution if you want to have the best quality viewing experience. Whether you like to watch your movies with the lights on or off affects the quality of the picture, so if it’s lights on go for no less than 3000 lumens; if lights off is your thing, anything under will work perfectly. Finally, think about how you watch your movies? Are you old school and have a full DVD collection? Or do you download and stream all of your favourite content? However you watch movies, the best home cinema projects have set top boxes with HDMI, VGA and USB ports so you can connect your DVD and Blu-Ray player or your laptop for easy watching. Depending on the size and quality you’re after, a good home cinema projector could cost anything between £2,000-£8,000. However, if your purse strings won’t stretch quite that far there are projects out there for under £1,000 that can still provide cinema-quality viewing. When considering buying a home cinema projector, think about whether you want to project onto a screen or the wall so you can factor in any extra costs for accessories. We’ve picked out some of the best home cinema projectors to suit all types of home and budgets. So call your mates, get the popcorn at the ready, and settle into your favourite blockbuster. The Optoma UHD60 is a great quality projector that users say is excellent for both movies and gaming. Customers found it a breeze to set up and it can be combined with an Optoma pull screen (sold separately) or projected onto a wall depending on your personal preference. The vertical lens shift also means you can set it up wherever you want without compromising on the picture quality. 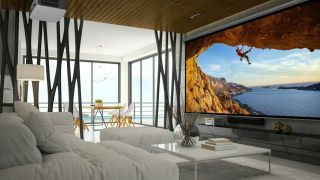 It only has 1800 lumens which mean a bright room may drown out the picture, but for viewing in a dark room, the 4K UHD Resolution does not disappoint. The screen size you get with this projector is huge; much bigger than you’d ever get from a decent LCD or OLED TV, and you know what they say; bigger is always better. If you’re going to be sharing a home cinema projector, then you’ll want something that can cater to everyone’s needs. Users have praised the excellent quality of this projector in both long and short throw, and it also features 2200 lumens which make it great for watching movies both with the lights on and off. You can download a corresponding app which can then be used to control the projector from your smartphone, and all in all, customers found it incredibly easy to set. The only niggle users had is that it is a little noisy at times but does not detract from the sound quality of the movie you’re watching. This home cinema projector is at the pricier end of the scale, but if you’re all about your picture quality, you won’t get any better than this. This 4K home cinema projector is easy to set up and runs smoothly and silently for the best viewing experience. It only has 1500 lumens, so it is designed for viewing in the dark, but it has a horizontal and vertical lens shift so you can adjust this projector for the most comfortable viewing. It has plenty of connections including HDMI and USB so you can choose your preferred method of viewing. It might not be one for the lounge, but if you’re serious about your cinema, this is a solid contender for your home cinema. This lightweight and portable home cinema projector is perfect for those who like getting their friends together for big sporting events or movie marathons because it doesn’t have to stay set up in one place. If it’s your mate’s turn to host, take it round and simply plug and play. Anywhere can be your cinema as it’s brightness means you can watch things in light or darkness and it is compatible with laptops, DVD/Blu-ray players and wireless devices. It’s only HD ready, but customers have been very impressed with the images and the internal speakers are of surprisingly good quality too. For under £500, the picture quality on this home cinema projector is very good. It’s a short throw projector which means that you’ll still benefit from the excellent resolution and screen size even if you don’t have a large room to work with, and the brightness makes it perfect for clear and crisp images even in a well-lit room. Customers have said that the integrated speaker is better than they would’ve expected but in order to have the best viewing experience possible they would recommend connecting to external speakers to really pack a punch. 3D movies have become incredibly popular over the last few years and now you can enjoy them in the comfort of your own home with this 3d home movie projector. It may not have the best specs in terms of resolution and brightness, but this projector does have a colour management tool which allows you to manually tweak the saturation, grain and hue individually for comfortable viewing. Although this projector supports 3D viewing, it does not come with glasses so you’ll need to purchase those separately, but one thing users did find good was the integrated sound quality – so you don’t have to waste any extra time faffing about with external sound systems if you really don’t want to. Read all about the best kit for setting up your own home cinema here.